July 17, 2015, 10:51 AM · Some good news for music education in the United States: the U.S. Senate named music as a "core subject" in its Elementary and Secondary Education Act (ESEA) reauthorization proposal, the Every Child Achieves Act (S. 1177), which passed Thursday with strong support on all sides, with a final vote of 81 to 17. "By naming music and arts as core subjects in the Every Child Achieves Act, the Senate has acknowledged and begun to address the national problem of the narrowing of the curriculum that has taken place under No Child Left Behind (NCLB) for more than a decade now," said the National Association for Music Education. No Child Left Behind's list of core academic subjects: "English, reading or language arts, mathematics, science, foreign languages, civics and government, economics, arts, history, and geography." Every Child Achieves Act's list of core academic subjects: "English, reading or language arts, writing, science, technology, engineering, mathematics, foreign languages, civics and government, economics, arts, history, geography, computer science, music, and physical education, and any other subject as determined by the state or local educational agency." Why does this matter? Because it helps us move toward including music education as an essential discipline in children's lives: a discipline worthy class time, worthy of a thoughtful and rigorous curriculum, and worthy of adequate funding and resources. Music does not have the same kind of educational effect when it is relegated to the "extracurricular," when it is taught by part-timers with inadequate materials, when it is funded in a piecemeal and unreliable way. Let's hope this is a step in the direction of rebuilding our system of support for music education in the United States. July 17, 2015 at 06:32 PM · It's about time. Educators have for years looked at music as a stepchild. Music students are the ones who go for higher education and are often in the world-leadership category. Think they don't get enough activity? Ever seen a marching band in action? July 17, 2015 at 11:44 PM · Finally! How sad that music has been treated as the unwanted stepchild of education, grudgingly funded with the leftovers and cut when the leftovers were insufficient. Perhaps now music will take its rightful place as being essential to a well rounded education. July 19, 2015 at 02:26 PM · OK This is one step forward BUT if quality private lessons are not affordable to the common man where does this get us? I have seen too many skilled students with drive that were left in the ashes. What a LOSS! 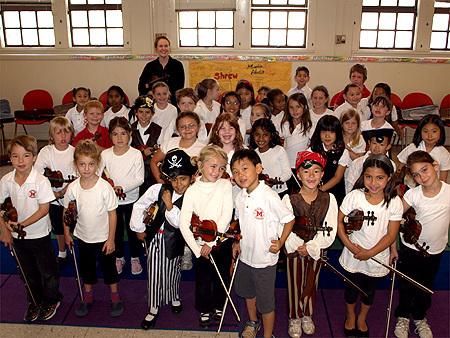 July 19, 2015 at 09:36 PM · There is no way that public school music will replace individual private lessons on a specific instrument. That's not the point. An appreciation of music and the development of a certain level of skill enough to play in the high school marching band or orchestra will go a long way. July 20, 2015 at 01:58 AM · This is wonderful news. I do think we have a long road ahead for music education. There are so many things we need to see happen in order to make sure that we provide the quality of music education we need for our children. July 21, 2015 at 01:54 AM · In the 50's, in my elementary school (Sauganash in Chicago, IL), every classroom had a piano, and every teacher could play it. We had music every day, and it was my favorite part of every single day! Three cheers for music being named as a "Core Academic Subject" in the U.S. Education Act Proposal! July 22, 2015 at 04:19 AM · This is just wonderful. Congratulations for the article. It´s what we need in Latin American Countries. are demonstrated by many educators. It is not only that Music develops creativity and sensibility, but it develops intelligence, corporal skills, the ability to work in group, to respect the others and to hear landscapes around. It helps to learn other subjects at school. It is difficult to understand how there are many countries where Music Education is absent in the scholar curriculum. Music Education should be taught by excellent teachers. It is not enough to know about music, it is necessary to know how to teach it. More children learning music-less children watching TV-less drugs for the youth-more friendship.more peace-more love for humanity- more harmony in the world.